Forums - Too Many Diffusers? Well, Raven is cleaning house and asked me to take his Rolling Diffusers lab Styrofoam diffusers with the prospect of fixing them up and selling them or keeping them for a very reasonable price. My room is now basically lined with diffusers. Listening in that kind of environment is kind of disorienting as much of the sound is, well, diffused. The imaging is great and the clarity of the sound is fantastic. I am just trying to sort out how I like it. I envy your position, I am in need of some room treatment. After your have made an assessment of your requirement it may be possible for me to take some off you. glineus, are you in the Chicagoland area? If so, I do have more stuff I'm parting with - but a lot of it is real wood and rather heavy, so shipping isn't really an option. Sorry but I am in Trinidad & Tobago, West Indies.I normally have purchases shipped to my US shippers in Miami, Florida. My son was over last night and he listened for about an hour. I wish I had written down his first response because I think he nailed it. He said something like it was quieter, allowing you to hear more of the music. This was also his first time hearing the 25th anniversary amp as well so I don't know which to attribute his comment to. Probably both the amp and the diffusers. Palamino, You can never have too many Diffusers.....Cow Bells as well. (damn, where's that cow bell emoji when you need it). In any case, when I look at this image that you have posted and apply the "how can I make this sound better" without complicating it with costs, effort or practicality I come up with some ideas I'd like to share with you. This is kind of my methodology, which is to set the goal high and work backwards from there to a point somewhere in-between the two. 1) six foot wide thing on the ceiling starting about 2 feet behind (and above) your head going toward the speakers. Could be more diffusers, could be bubble wrap, could be fiberglass or lambswool. 2) put 3/4 MDF or particle board panels that are 1 inch smaller than the ceiling tiles above each tile to add mass. Trust me you'll hear this one. 3) replace the carpet with a heavy commercial carpet pad and 1/2 inch plush carpet on top from corner to corner. At a minimum create a large area rug with the same pad under it on top of the carpet you have. 4) Everywhere you see wall paint/drywall cover with 2 inch acoustic foam tiles. 5) foam tiles on top of the sub woofer cabinets to improve imaging. 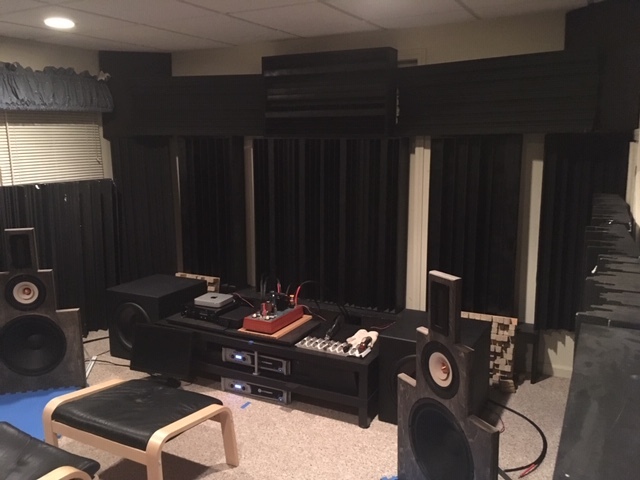 6) the 360 wood diffusers leaning up against the back wall on each side should be re-located to the floor in front of the audio rack leaning back against the rack like the speaker grill on the left. Alternately and perhaps even better would be to put them flat on the floor directly in front of each speaker no farther than 2 inches away. 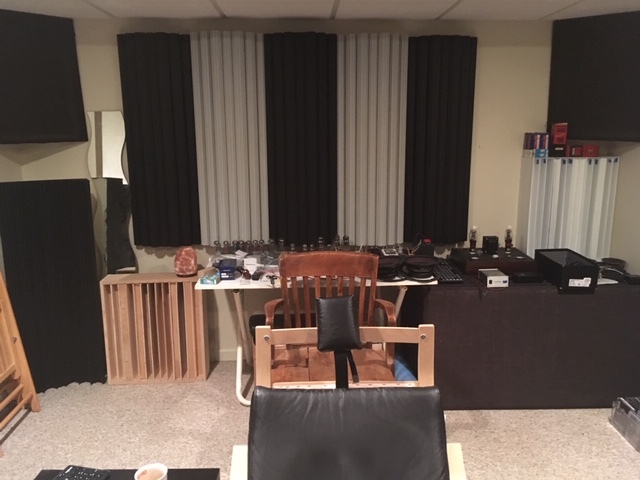 7) create some diaphragmatic bass traps that are 12 x 12 x 48 and put them on the floor along the baseboards on side walls to give you a linear broad-band bass trap down to 60Hz for the room. If you make it this far and by some chance complete all of the above, you'll have to re-adjust the speakers back slightly. 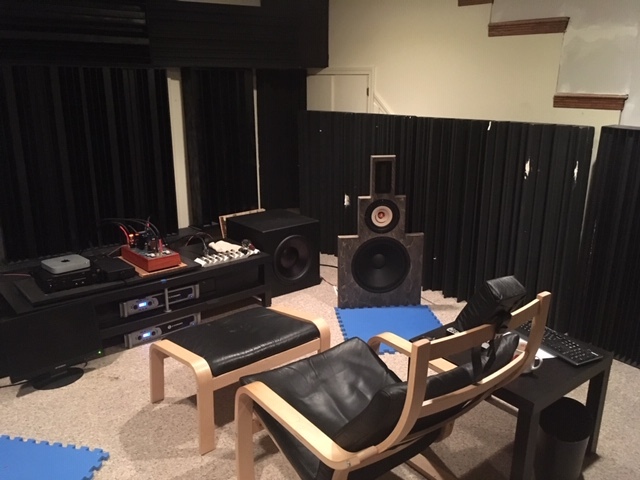 Also, pointing the subwoofer at the back wall and flipping the polarity both ways to listen to result might be an interesting evening. Also rotating them 90 degrees to face the side walls and then putting diffusers on the surface facing you might also work well. Keeps the woofer cone isolated from the back wave of the open baffle which should improve focus. Your room is too bright at the present. So as not to dull the diffusion by stretching fabric in front of the diffusers, lets get the remaining flat surfaces softened so they absorb down below 1K. The floor carpet enhancement is diaphragmatic. It will make an insane improvement in focus. The ceiling will make an insane improvement in the bass quality which will in turn enhance midrange focus. The journey is the experience. Why rush it, I agree. The amp is sounding so good the last two days! I did play around with the subwoofers and achieved a little better focus. I have a good amount of mdf laying around so I may try that on the tiles. Those drop ceiling are a pain because certain frequencies can cause a rattle. Would placing the tweeters beside the mid drivers instead of above them be worth a trial? Sorry Brian, just saw this. I'm not sure. I just cleaned up my garage though, so I won't be making new baffles soon. They certainly look like speakers that would have great sound. They held up pretty well to many of the speakers I heard at AXPONA today. Certainly better than some.